There is an article each week about some left-wing professor spouting some nonsensical theory that denigrates American society, portraying a dystopian nightmare filled with a white patriarchal system of oppression, hell bent on terrorizing women, minorities, and anything else non-white male. Townhall has written multiple articles about such professors. One reader asked why is it that we highlight these stories. In other words, “Who cares? We don’t attend these colleges, so why should we be concerned with what a crackpot professor says?” But, these stories are important to highlight because they show a larger problem within our society. One that can be changed, but only if light is shed on the problem in the first place. As Conservatives, it is our job to not only show these issues, but also offer a better alternative than what the left is producing. Take the latest story from the bizzaroland of higher education as a prime example. Stephanie McKellop is a graduate teaching assistant at the University of Pennsylvania. Earlier this week on one of her social media accounts, she proudly proclaimed her system in choosing who answers what questions in her class. “I will always call on my black women students first. Other [people of color] get second-tier priority. [White women] come next. And, if I have to, white men,” she said. 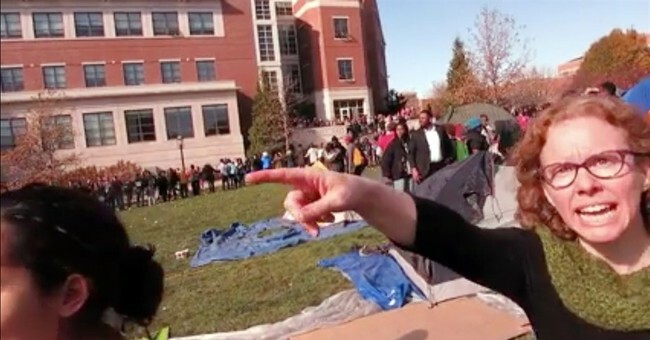 Understandably this story caught fire in right-wing media for her blatant discrimination, at which point McKellop was in some way reprimanded by the university. She tweeted, "Penn thinks I'm racist and discriminatory towards my students for using a very well worn pedagogical tactic which includes calling on [people of color]." Further showing her supposed liberal tolerance, she went on to call those who criticized her "white nationalists" and "Nazis." In a series of tweets, McKellop highlighted what she called “progressive stacking.” Progressive stacking is the idea that due to their history of bigotry and oppression, white men should be picked on last in the classroom to give equal education opportunity to women and minorities. It lacks any credibility because one would assume that if all the students are attending the same college and are in the same class, they all at least met some minimum standard of entry and are already all equally qualified in that regard to be at the university. In her mind as a teaching assistant, it is her duty to impose discrimination against white men as a form of social justice. But in truth, this story is not that bizarre in terms of what to expect on a college campus. None of the stories should be surprising. Higher Academia is obviously liberal. It always has been. Increasingly though, it seems that higher academia is instead moving away from arguing for communism or a larger federal government and instead, as McKellop does, views its purpose as ingraining in our society the idea that America is an inherently evil place. Probably a lot of conservatives would argue that this has always been the academic left’s cause, but the debate over when the shift away from education and towards indoctrination of a self-hating society began can be held another time. The important thing to recognize is that it is happening now and happening in places such as U-Penn where they actually are producing the future leaders of our government. To those on the left currently in academia, we are a nation of white men who have contributed no benefit to the world whatsoever. They see it as their job to pass this on to the next generation. This is dangerous for many different reasons. If America dwells on its mistakes and teaches multiple generations that our history is one of malice and deceit, then our structural foundation will crumble and the freedoms granted by our Constitution will completely dissipate. Neither will happen tomorrow or even next year, but much further down the road. The distortion of our history will leave a future America bleak and fundamentally changed with citizens having little to no confidence in their fellow man, our Constitution, or even the institutions of government which have helped make our nation as successful as it is. Thus, society would be victim to the perceived experts in higher academia. A negative conception of mankind and America would deplete our nation’s morale, allowing our great nation to fail, hamper the ability to help those less fortunate, and even thwart our capability to defend ourselves. For those short sighted individuals who cannot comprehend why or how this would happen, consider the following metaphor. Surely, many of our readers have been a part of a championship team or a very successful sports program. They are the pinnacles of their leagues and many teams envy them. Likewise, those same readers may have been a part of a dismal sports program that consistently loses and is plagued by mediocrity and failure. This program is the laughing stock to their conference. The championship team takes itself very seriously, believes in the philosophy and guidance of its coach, and earnestly cares about the traditions in said program. They acknowledge their mistakes, but sincerely believe that any mistakes of the past can be overcome. The mistakes are not important to this team; the lessons learned from these mistakes are. At the same time, they focus and highlight the greatness of what they do to act as a model for their future teams and teammates. They are successful because they are mentally tough and confident, priding themselves on exceptionalism while also working diligently to rid themselves of detriments to success. On the other hand, the losing team has no senior support, the coach does not take his program seriously and has no high expectations set before, so the team languishes in obscurity and does not deserve to be a leader of its conference. Furthermore, no teammates want to take charge and be leaders because they are complacent and content with their level of play. It is not because these players are poor athletes, but simply because they have been taught both by words and example that they are a bad team. They are given nothing to motivate them or believe in. This team is structurally different from the winning team. For both programs, this type of thinking was instilled over a long period of time and their subsequent successes or failures are representative of that. Take either of these programs, turn them into an educational curriculum, multiply that by thousands of colleges, and America is left with two options. Option two is bleak. It is a nation that has no confidence in its government, does not believe it can contribute anything positive to the world, and dwells on a past full of regret and haphazard attempts to remedy situations. Therein lays the stark difference between conservative thinkers and progressives. Conservatives argue a forward thinking model that sincerely believes our best days are ahead of us. Progressives rely on a negative concept of America and think we must focus on our past transgressions much more than our potential future success. These progressives in the classroom are currently training their students that America is a "bad team." In their mind, it is not even worth fighting for and should be fundamentally transformed. That is why we must continue to show these stories so that more conservatives will be emboldened to stand up on campus, become professors, and fight back against the campus craziness that will ultimately doom America if we do not stop it in its tracks right now. Author's Note: Education has long been an interest of mine. This article uses a lot of the same material for an op-ed I previously wrote.